Three dimensional art of any kind is a physical fact. This physicality is its most obvious and expressive content. Conceptual art is made to engage the mind of the viewer rather than his eye or emotions. The physicality of a three-dimensional object then becomes a contradiction to its non-emotive intent. Rhona Hoffman Gallery is pleased to present two solo exhibitions, Sol Lewitt: Concrete Block Structure and Fred Sandback: Sculptures. In 1985, Sol LeWitt’s first cement Cube was built in a park in Basel, Switzerland and marked the debut of a series of experiments with concrete block structures. The choice of material originated during LeWitt’s residence in Umbria, Italy in the early eighties. For LeWitt, the concrete block satisfied his quest for a material that was common and accessible. Aligned with his development of a single idea through multiple modular method of construction, the concrete block became a new module like the square or cube of previous works. The modest building component conjures an association to architectural necessity as opposed to considered formal design. The material is wrought with contradictions: impenetrable yet vulnerable, unfinished yet resolved, grounded yet mobile. LeWitt’s concrete block structures were more public than his previous three-dimensional work, not only in their locations but also in their reference to history and archaeological memory. The concrete block structure on view at Rhona Hoffman Gallery, Negative Pyramid, references the mausoleums and temples of Egypt and pre-Colombian Mesoamerica. Yet, born against the backdrop of a “countermonument” trend of the eighties, the concrete block structures resist direct connection to any specific event. Negative Pyramid proposes a passage to an indeterminate destination. Its terraced formation presents a grid or map measuring the intervals between one potential point in space and another. Its orientation in the gallery suggests site-specificity, differentiating it from its original installation in Galerie Pièce Unique in Paris in 1997. Also visible from the street and exhibited in the building’s hallway is Sol LeWitt’s Wall Drawing 644, first installed in the Galleria Ugo Ferranti in Rome in 1990. Using color ink wash and pencil, this Wall Drawing is another example of LeWitt’s use of a formula composed of a vocabulary of elementary forms and techniques. Executed directly on the wall from a set of precise instructions, the drawing integrates the draftsman’s decisions and references the architecture of the site. 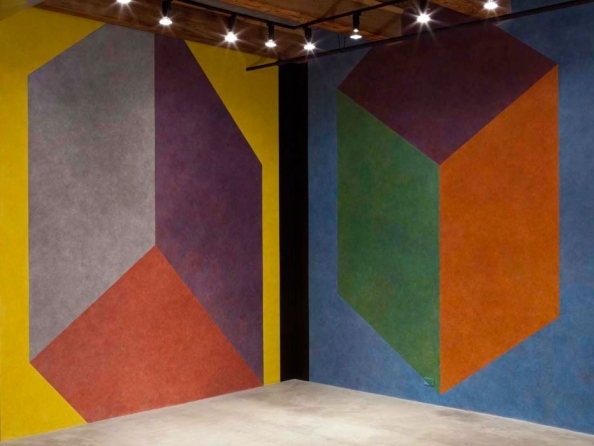 Sol LeWitt: Concrete Block Structure is the gallery’s thirteenth solo exhibition of LeWitt’s work. Exhibited concurrently with Sol LeWitt: Concrete Block Structure is the solo exhibition Fred Sandback: Sculptures. In 1986 Sandback, in looking back over twenty years of a consistent art practice, wrote "The first sculpture I made with a piece of string and a little wire was the outline of a rectangular solid . . . lying on the floor. It was a casual act, but it seemed to open up a lot of possibilities for me." This exhibition marks the 6th solo exhibition for the artist at Rhona Hoffman Gallery and the gallery is featuring sculptures that span the period from 1976 to 2002. The sculptures are composed of acrylic yarn, a material that for Sandback held no significant associations. The yarn’s soft, fuzzy profile invokes a less crisp line than that produced by other mediums, and its fiber makeup absorbs rather than reflects light. The resulting effect allows for a seamless and symbiotic relationship between the material, its composition and the site it inhabits. The mutable character of any Sandback sculpture is relative to its site, and its proportions are calibrated in response to the site’s architecture. While the line of yarn never posits to be more than a line, the linear imagination of the viewer envisions a plane. Trajectory, ascent and descent (the inherent qualities of a line) subside as the vibration of the invisible planes take precedence. The otherwise elusive void or vacancy is given form, illustrating Sandback’s ability to reveal the relationships between the incorporeal and concrete, the ethereal and the tangible.